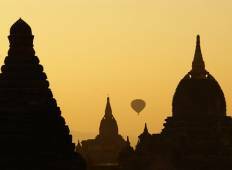 See the top Cultural trips that go through Myanmar (Burma). With 112 tours to choose from, they range in length from 3 days to 26. The most popular month for these tours is November, which has the most departures. "This tour has an excellent itinerary. Our tour leader Thant was outstanding, making..."
"We have just returned from an 11 day tour of Myanmar through EMH tours and it was..."
"The guide was excellent. Smart, helpful, very personable. The tour was well planned..."
"Well organised and professional company. Always answered questions quickly and provided..."
"We had such wonderful time! Thank you for your attention to details and organizing..."
"All of our tour guides did a great job and explained a lot about each city we visited...."